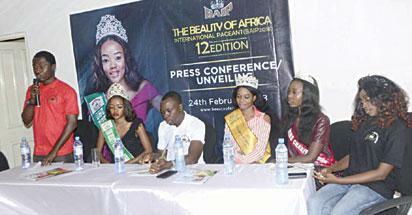 The International Organising Committee of The Beauty of Africa International Pageant (BAIP), has flagged off its campaign for 2018 at a world press conference which held on Saturday, February 24, at The BAIP corporate office located on Allen Avenue, Lagos. According to Kenneth Ighodalo, the PR/Marketing Consultant, as the 12th edition of the pageant unfolds; corporate organisations and credible stakeholders should take advantage of the huge and well packaged marketing platform of the pageant in order to sell their products/services as this year’s edition promises to be bigger and better. “BAIP’s 12th edition promises to be explosive as it is in partnership with the Federal Ministry of Information & Culture. As expected, this year’s edition, will attract an audience of more than 20 million persons, at the pre-event, press conferences, camping and grand finale which will play host to the crème de la crème of the corporate world, top Government personnel, showbiz gurus, celeb, brand owners, top models, fashionista and all credible stakeholders that matter in the industry. The grand finale is scheduled to hold on October 6, 2018, at Shell Hall, Muson Centre, Lagos”, he said. According to Daniel Opuene, President BAIP, the star prize winner gets a brand new car, mouth watering cash price and wardrobe allowances for one year including a one year modelling/marketing contract and an opportunity to represent Nigeria at the Miss Tourism International 2019 World finals. For the first runner-up, it is a cash prize, wardrobe allowance, modelling/marketing contract and an opportunity to represent Nigeria at the Miss Supranational 2019 world finals. The second runners-up also gets a cash price, wardrobe allowance, a marketing/modelling contract and a chance to represent Nigeria at The Miss Globe 2019 world finals. The third runners-up gets a cash prize, a modelling/marketing contract and will represent Nigeria at Miss Tourism Queen of the Year International 2019 finals, while the forth runners-up gets a mouth watering prize, a modelling/marketing contract, an opportunity to represent Nigeria at the Look of the Year 2018 world finals. Among others, BAIP Boss, Mr. Daniel, disclosed that a total budget of N86, 658, 304 has been projected for the event. The post Beauty of Africa International Pageant flags off projects appeared first on Vanguard News.